17th November 1986 - Cassette Single ! Detail : Paul's thirty-eighth single. 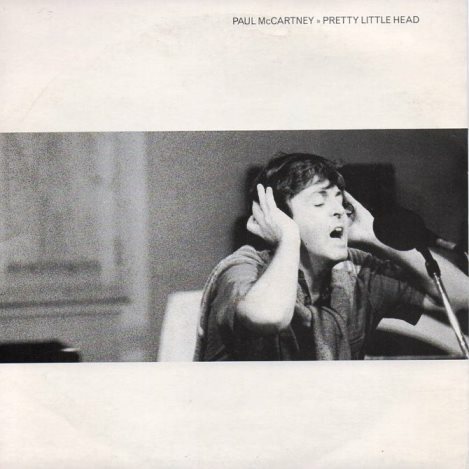 Both sides of the single are written by Paul along with Eric Stewart, and can both be found on the C.D. "Press To Play". The B-side though is ONLY on the C.D. version, it is NOT on the vinyl. Hence the most unusual fact that the label, says on the A-side "From the album", and the B-side says "From the C.D." ! The A-side is a remix of the album track, mixed by Larry Alexander, and is shorter than the album version, coming in at 3:50. The 12" was released the same day, has a longer A-side remix this time by John Potoker at 6:56, with the same B-side as the single, plus an extra track of "Angry", remixed by Larry Alexander and running at 3 seconds longer than the album version. A video was shot, but is scripted as a storyline (which seems better suited to "She's Leaving Home !). Paul only appears in a cameo spot which he filmed in London on 18th October. With the single failing to chart, three weeks later Paul released his first ever cassette single which contained the same tracks as the 12" ... it didn't help, it still failed to dent the Top 75 ! 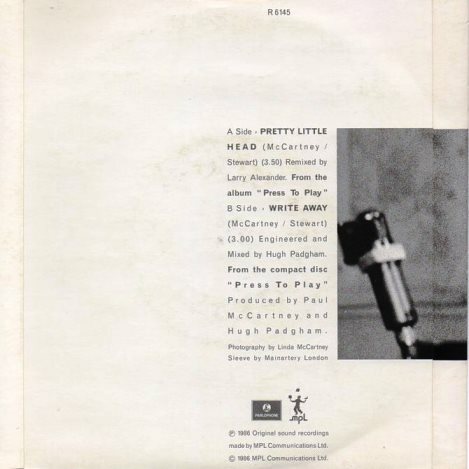 The single was released in a picture sleeve, with photography by Linda.